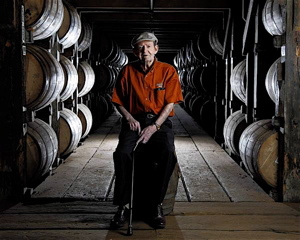 Elmer T. Lee (1919-2013), was the master distiller emeritus at Buffalo Trace Distillery in Frankfort, Ky. There sure are some joyful spirits up in heaven shaking Elmer T. Lee’s hand and giving him a thankful slap on the back, as he was personally responsible for a goodly portion of the angels’ share of fine Kentucky bourbon that drifted skyward over the past 60 years. Mr. Lee was known as the master distiller emeritus at Buffalo Trace Distillery in Frankfort, Ky., and was a legend in the bourbon industry. He is the man responsible for the single-barrel bourbon craze that kicked off the whiskey revival across the world over the last 30 years. We lost that legend last week, when Mr. Lee died Tuesday after a short illness at the age of 93. I can’t say I knew Mr. Lee all that long, but I was quite familiar with his craft and handiwork. As a young Capitol Hill staffer in 1994, I along with a motley crew of Confederate carpetbaggers, were enthusiastically working the halls of Congress, when the Republican Revolution came to pass during the midterm elections of that same year. Bill Clinton was two years into his first term when Newt Gingrich came peddling his poorly conceived snake oil that was the “Contract with America.” It may have all been smoke and mirrors, but the Republicans gained control of the House for the first time in 40 years. The blood lust created from all these red meat Republicans in one city ushered in a dining renaissance. Suddenly whiskey, cigars and high-end steak joints were all the craze in DC. 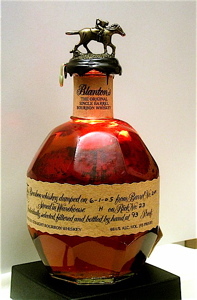 Blanton’s Bourbon, with eight different stopper designs, that show the racehorse in its full range of motions. I was a Kentuckian by birth, so it was rare you would find me without a bottle of Maker’s Mark or other Bluegrass distillation nearby. My circle of friends was into premium liquor, and we hosted our own whiskey tastings. I clearly recall the first time I put down the nearly $50 required to buy a bottle Blanton’s bourbon, which was Mr. Lee’s single-barrel contribution to the market. I bought it at Schneider’s on Capitol Hill, which is an amazing place to purchase liquor, and took it to a tasting. Pulling that bottle out of its green and gold box was like opening up a mystery. All of us were familiar with the traditional brands, they had been around forever. Blanton’s was new to us, and a step up. Out of this silky cloth bag came a rounded, multi-faceted orb of a bottle, with a hand-etched label noting the warehouse, rick, barrel and bottle number, with a gallant jockey and racehorse perched on top. At over 12 years old, an ice-cube or two was all that was necessary to open up this robust 93 proof nectar. It was amazing sipping whiskey, and led to a night of swapping tall tales, amidst good friends and air thick from Hoyo de Monterrey cigar smoke. Mr. Lee was born in Franklin County, same county where Buffalo Trace Distillery is located, on a tobacco farm near Peaks Mill in 1919. He graduated from Frankfort High School in 1936 and worked for Jarman Shoe Co. until December 1941. During World War II, he was a radar bombardier on a B-29 Superfortress, flying missions against Japan through 1945. In 1946, he was honorably discharged and returned home to study engineering at the University of Kentucky in Lexington, where he graduated with honors in 1949. 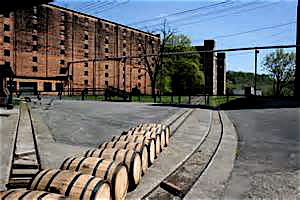 Barrels waiting their turn at the Buffalo Trace Distillery, which was named a national historical landmark in 2013 by the National Park Service. That September, Mr. Lee took a position in the engineering department with the George T. Stagg Distillery in Frankfort (which later became Ancient Age, and then Buffalo Trace in 1999). By 1966, he became plant superintendent, and then plant manager in 1969. It was in 1984, one year before his retirement, that Mr. Lee introduced Blanton’s to the world. It was the first single-barrel bourbon. It became a hit, first in Japan and then elsewhere, and led to the bourbon industry’s reinvention, with its turn to premium spirits. Likewise, it’s hard to imagine there would be a Kentucky Bourbon Trail if Mr. Lee had not bottled Blanton’s, which led to Jim Beam, Wild Turkey, among others, coming up with popular premium and ultra-premium labels. Mr. Lee put a face behind his bourbon, by getting out and traveling to promote the products from Buffalo Trace, and offer tastings to fans and the uninitiated – which is a hallmark adopted by all the distilleries included on the Kentucky Bourbon Trail. After his retirement in 1985, Mr. Lee became an ambassador for Buffalo Trace. A year later, he was honored with his own eponymous single-barrel label. Mr. Lee continued to visit the distillery weekly to taste potential bourbons for his own Elmer T. Lee single-barrel label and to sign bottles and memorabilia. This entry was posted in Food, Liquor, News and tagged Blanton's, Buffalo Trace Distillery, Elmer T. Lee. Bookmark the permalink.